“Fire everyone, tank the season, burn the city to the ground!”. For many sports fans, this is the prevailing sentiment one has after a loss, particularly, a deflating loss. After Sunday’s defeat at the hands of the Cleveland Browns, many Baltimore Ravens fans now shared and vocalized this mood. While the loss was inexcusable and the result of a very poor performance, there is one thing I want to make clear. The sky is not falling. To feel demoralized after a defeat is common. But to suppose that the best course of action is to give up on the season is absurd. All teams will face adversity throughout the year. If the Baltimore Ravens clean house and tank the season, it would only result in long-term failure for the franchise. Since when has tanking ever worked for a team in any sport? It never has. Everything that the team built and worked for would be thrown out. Even though it can reward a team with a higher draft pick, success is sacrificed for the simple hope that something will eventually go well in the future. For any team, especially one built in a culture of winning like the Ravens, to tank, is a waste of time and resources. After establishing that purposely sabotaging the season is not the answer, it should be established that the Ravens have no need to believe that the season is anywhere near over. All teams face adversity, and the Ravens are no exception. The Ravens typically have at least one game where the team performs poorly, and always bounce back quickly. Last year, the Ravens lost to Jaguars in a total smackdown in London, and the Bears without scoring an offensive touchdown. In the previous year, the Ravens lost to the Redskins just 16-10. In both of these years, the Ravens came just one play short of missing the playoffs. Before assuming this is just an occurrence in years Baltimore misses the playoffs, consider this. In 2014, the Ravens lost to the Colts, in week five nonetheless, by a score of 20-13. Baltimore scored just one touchdown in this week five loss in a season where the offense went on to be one of the best in franchise history. It should also be noted that the Cleveland Browns this year are a much-improved team. This is not the same team that went 1-31 in the past two years. In just the first five weeks, the Browns have two wins and a tie. 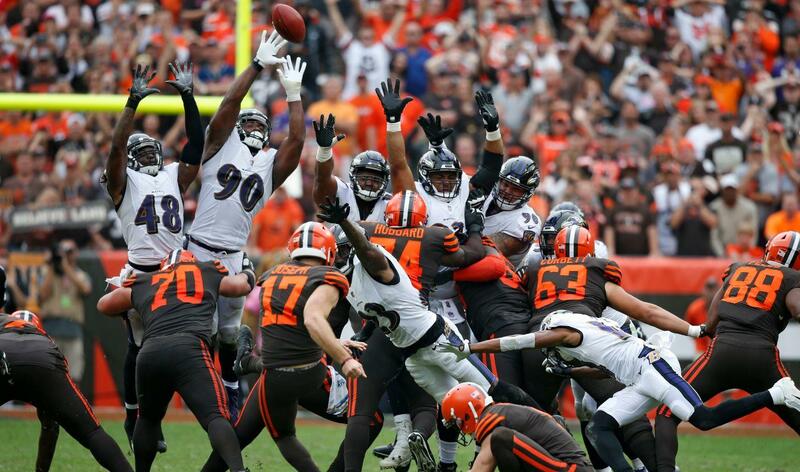 If the Browns had a reliable kicker for the first two games of the season, the team may very well have had a 3-1 record before facing Baltimore. To equate this year’s Cleveland Browns with the failures of the past Cleveland Browns is a major disservice to Cleveland and oneself. Even with this loss, Baltimore is not out of the playoff race by any stretch of the imagination. The Ravens are only one game behind the division-leading Bengals. There are also only two teams in the entire AFC with better records than the Ravens, the Bengals, and Chiefs. Finally, if the previous success this team achieved during the rest of the season is any indicator, it is a good one. The Ravens offense was explosive in three out of five games. One could even argue it exploded in the second half of the Bengals game, but the effort was fruitless. The defense still has yet to allow a second-half touchdown. Again, the defense, through five weeks, has not allowed a single touchdown in the second half. This is an insane statistic and proves that the Ravens can now close games on defense, something that eluded Baltimore in past years. Another eye-opening statistic: The Ravens have held opponents to an average of 15.4 points per game. The offense has scored an average of 26.4 points per game. The Ravens have the talent, skill, and drive to win games. It is undeniable that this team is in a better position this year than last year. Joe Flacco, bar one game, has played lights out. The new receiver corps, even with Michael Crabtree’s drops, is infinitely better than last year’s group. The defense is even finishing games, a feat unfathomable during Dean Pees’ last few years as defensive coordinator. The Ravens cannot forget this loss to the Browns. Baltimore was visibly unprepared for a competitive Cleveland Browns. This game will be used as motivation moving forward, and do not underestimate what motivation can do to a football team. Perhaps the 2012 playoffs would be a good reminder of the power of motivation.